I’ve rounded up some of my favourite books and bookish gifts to help you decide on Christmas gifts this year. I also want to recommend a book voucher for children whose reading tastes you don’t know well. When kids own the choice they make regarding books, they are so much more likely to WANT to read them, that a voucher frequently makes a truly thoughtful and practical gift. Some kids are not yet sold on reading, so I’ve included “bookish” gifts where they’ll read, but not be daunted by lots of text. For kids who love to read, you'll find books for older readers that I loved as an adult, and for those who like to buy Christmas themed books and bookish fun, you’ll find those too! We first met Cleo, the little girl with a big imagination, in The Cleo Stories: The Necklace and the Present. In fact the first book was chosen as the winner of the CBCA’s 2015 Book of the Year Award for Younger Readers. In The Cleo Stories: A Friend and a Pet, Cleo must solve more problems. She needs to work out what to do when boredom is driving her crazy, and how to go about getting a pet of her very own. Cleo's best friend is away, her parents are busy, and there's nothing to do but count raindrops - or tidy her room. Just when she thinks she'll never cheer up, Cleo has an idea. In the next story, Cleo longs for a pet but her mum and dad say no. Perhaps the answer is hidden somewhere unexpected. Children don’t need to have read the first Cleo book to appreciate this one, but why not get both? The books are beautifully illustrated junior chapter books that are perfect choices for newly independent readers. Written and illustrated by N.J.Gemmell (Nikki Gemmell), Coco Banjo has been Unfriended is a graphic novel published by Penguin Random House, Australia (2015). It's time for school camp and some spectacular, Coco-licious adventures! But two problems could ruin everything . . .
Jay Page is hiding his pet rat in his bag. Worse, Coco's best friend N wants to join Belle's group. Has Coco been UNFRIENDED? Can Miss Trample really ban Coco from the disco? Could this camp get any worse? Coco needs an amazing plan to make things right. Maybe the Prime Minister can help! Girls 8+ will relate to Coco and take delight in all the bookish bling - decorative fonts, quirky comic-style sketches, fashion notes and wry humour dance from the pages. Gemmell knows how kids talk and what will interest them, and Coco is an impulsive but invincible heroine - fabu-licious! Many of our newly independent readers will be looking for a novel to read, but they are not ready for middle grade chapter books. Here’s a junior novel that might suit them perfectly. At My Door was written by Deb Fitzpatrick and published by Fremantle Press (2015). Young readers will quickly relate to Poppy and her brother in this unusual situation. The toddler, Mei, is also totally believable - and loudly distressed. Fitzpatrick includes humour in the story so it’s not too heart-rending for kids, but it will certainly give them pause for thought about children who don’t have stable home lives. Chapters are short, the dialogue authentic and the language structures are kept simple without being boring. Here's a children's book by Alexander McCall Smith, with illustrations by Iain McIntosh, published by BC Books (2015) (NewSouth Books in Australia) is a junior novel I think would suit children 7+. Do you know McCall Smith’s adult books about Precious Ramotswe of the No. 1 Ladies’ Detective Agency? This is the latest of his books for children, set in those years when Precious was still a child. She is an alert and curious youngster with a very kind heart who loves to solve mysteries. When she meets a new friend Nancy, Precious does everything she can to help Nancy solve the mystery of her past. The language is simple, and despite a dangerous night time encounter with some cranky elephants, the story is a gentle one, well-told. It’s a also a wonderful way for children to engage with the lives of other kids who live in Botswana. McIntosh’s name is not on the front cover of my hardback edition. I think he deserves much credit for contributing another layer to the book. His art work is in the form of wood-block style borders, cameos and chapter headers, that add a wonderful colour and flavour to Precious and the Zebra Necklace. The illustrations break up the text, and the large font helps make the novel more accessible to young readers. Pig Dude is the main character in this 64 page book by Michael Wagner, illustrated by Adam Nickel and published by Billy Goat Books (2015). Mama truly believes in Pig Dude, but can he really do anything? There’s only one way to find out. It’s time for Pig Dude to attempt the IMPOSSIBLE! Follow Pig Dude on a hair-raising, heart-warming adventure that celebrates what can be achieved when someone believes in you. The little guy’s determination to fly and hilarious misadventures will strike a chord with kids everywhere. Children will also understand why Pig Dude almost gives up, because we all have those moments when the odds seem stacked against us. The abundance of striking cartoon-style illustrations, the large print and the uncomplicated sentence structure makes this book a perfect match for readers who need to be charmed not challenged. You can read the first 15 pages at Billy Goat Books website. When Luke Skywalker Met Yoda and When R2-D2 saved the secret plans (lack of capitals hard to believe for second title, but true to the actual cover), were both written by Michael Siglain, with Art by Stephane Roux and Pilot Studio, and published by ChirpyBird, an imprint of Hardie Grant Egmont (2015). I would say the books target readers 5-8, but they would also work as a read-aloud for younger kids, and perhaps for (slightly) older kids who find reading difficult. For young Star Wars fans, or kids who just love action, adventure and lots of great illustrations to help the text along, here are two exciting tales. They feel true to the original movies and yet have very simple sentence structures to help beginning or struggling readers. The vocabulary is also mostly simple except for such necessary words as Imperial, droid, stormtroopers, Tatooine etc, in other words, vocabulary to give it the necessary Star Wars flavour. The illustrations have not tried to copy the movie, but are authentic to the movie - cartoon style and full of drama e.g. Darth Vader looks like his Royal Meanness and emanates power, but Leia’s face is nothing like the “real” Leia (who will always be Carrie Fisher, to me). 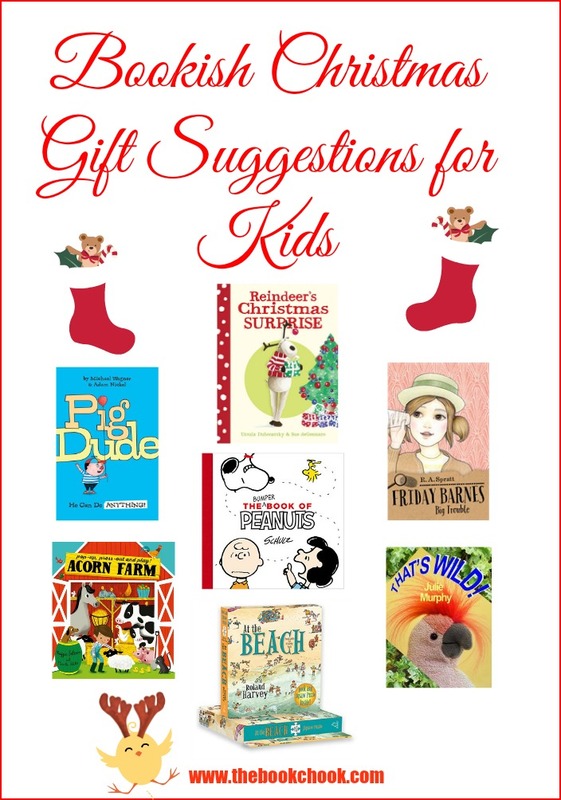 These make great stocking stuffers, and present lots of opportunities for reading, while the emphasis remains firmly on fun. The Anti-Boredom Book of Brilliant Things to Do, The Silly Book of Side-Splitting Stuff, and The Silly Book of Weird and Wacky Words, are all by Andy Seed and Scott Garrett, and published by Bloomsbury (2015). Let’s face it, there are times in all our lives when the situation calls for nibbles at a text rather than the luxury of a long uninterrupted read. If you know a child who enjoys language, who loves challenges, puzzles and messing about with words, do seek out this set of books from Bloomsbury. Any of them would make a great companion on a long trip or an excellent alternative to screen-based games. They are available in paperback, PDF or e-pub formats. I love Roland Harvey’s books and especially his illustrations. At the Beach is a wonderful Australian classic where we learn about a family’s holiday in Crabby Spit via their postcards to their Grandma. The postcards are very funny because they are typical postcards from kids, telling Grandma what the highlights have been for them. The illustrations in this children’s picture book are amazingly detailed so that kids will have lots of fun working out what’s going on, and spying all the things mentioned. Including a 150 piece jigsaw puzzle of one of the scenes from At the Beach is sheer genius - thank you, Allen and Unwin! Families can have fun doing the puzzle together, and this will be an excellent opportunity to discuss the image and use vocabulary that will help children internalise language from the book. At the Beach Book and Jigsaw Puzzle has a recommended RRP of $Au 19.99. Great value! Acorn Farm - Pop-up, Press-Out and Play! The book starts with a story. Jasper wants to find a missing lamb, but is distracted by Mum who wants him to do chores. We see several illustrations and the story ends with another task for Jasper - to bring up a baby duck. BUT THEN, there are several pages of press out cards which become standable pieces for re-telling the story. AND THEN, we open the last part of the book and it’s a gorgeous pop-up farmhouse with opening doors, and the fold out reveals other pop-up buildings too. What fun children will have making up their own stories using the card pieces as props and the farm as a backdrop! No, the book would not be a good choice for a youngster who likes to destroy things, but for children who will respect the limitations of card, it makes a versatile, educational and enjoyable gift. These two colourful books are based on the new TV series and inspired by the original Tashi books by Anna and Barbara Fienberg. While there is an exciting story in each, this is not the original text. However it may well be an introduction to the actual Tashi books for your kids/students, especially if they have seen the animated series on TV. There’s also a nice activity section in each book - irresistible invitations to write, word puzzles, jokes etc - created by Meredith Costain. Tashi and Jack are looking for a gift for Can Du's birthday, but when Second Uncle gives them a magic carpet they get much more than they bargained for. Will they be able to get the birthday boy back to his party . and save their village from destruction? Giants, ghosts, witches, bandits, demons, dragons . Tashi, Jack and Lotus Blossom are ready for anything! Jack and Tashi want to create a newspaper, but Tiki Pu always seems to have the scoop. However, when giants and ogres get involved, the news gets too big for the village bellringer. Are you one of those people who likes to have a book to do with Christmas among your children's pile of presents? Perhaps a librarian who knows children will love to borrow a book to stoke their own excitement? Read on to find some newly published books you might like. Kids will love Ruby’s mischief and the hilarious situations that result. Greenberg’s rollicking rhyme and rhythm gallop the story along like a herd of reindeer, while the illustrations simply explode with colour and fun. If you’re looking for a Christmas-themed picture book, The Naughtiest Reindeer at the Zoo is a great choice for families and libraries. When I was a child, Christmas meant book gifts. I can still remember most of them, and the delight they brought me as I read them over and over. I particularly loved the pop-up version of Cinderella I received, with its richly coloured illustrations. I love the way the pop-ups sometimes conceal a surprise, and that this traditional tale been given a Christmas theme. It’s a large, sturdy, delightfully illustrated book that I hope will become a loved family favourite. Dubosarsky tells the tale of Reindeer’s Christmas with gentle humour. Kids will love the magic of the refrain: 'What's inside -- what can it be? Open it and you will see!' and love to chant it. They’ll understand Reindeer’s longing for his family, and rejoice in his visitors. I wish I could be a fly on the wall to witness all the discussions as children try to determine exactly what IS in the sack left for Reindeer. The illustrations are delightful - you can’t help wanting to scoop up all the animals and cuddle them, especially Reindeer. There are lots of details to explore and giggle over - I especially liked Cat’s tree house, complete with Christmas ornaments, alarm clock, teapot and pile of books! This will make a truly delightful gift. Race with the animals as they try to deliver their letters to Santa before it’s too late! But look out for chugging trains, running reindeer, busy elves and more obstacles in their way! Sing along to the bonus CD by favourite children’s entertainer Jay Laga’aia too! As you will quickly realise, Mitchell has chosen a rhythm reminiscent of We're Going on a Lion Hunt. Lots of children will know the picture book or even the tale that book is based on, and will enjoy that familiarity and fun. Active kids will appreciate the ninja leaps and bounces, the chugging and the charges as the four animal friends go on their hunt for Santa. Come along with Bear, Lion, Monkey, Giraffe and Mouse as they travel by train, plane and bicycle to tell EVERYONE their exciting news — Santa Claus is coming to town! Sing along with Human Nature’s hugely popular CD recording of the much-loved Christmas song! Eckstrom's illustrations are gently colourful with lovely detail for kids to smile over - e.g. the page about Santa finding out who's naughty and nice features a very long-necked giraffe gazing at the Nice list where Mouse is crossing out Lion's name. This middle-grade novel was written by R.A.Spratt and published by Random House Australia (2015). I've previously reviewed Friday Barnes: Girl Detective, and Friday Barnes: Under Suspicion. R. A Spratt also wrote the entrancing Nanny Piggins books. In Friday Barnes: Big Trouble we get to see more of Friday’s amazing parents, in particular her father. He raises absentmindedness to new heights - ‘“He wouldn’t notice if you tied him to train tracks in front of an oncoming train,” said Friday.’ - when he (eventually) raises the alarm about his wife being kidnapped. Not only must Friday solve this dilemma, she needs to look after her helpless father, help Highcrest’s Headmaster, and work out what’s going on with master thief, the Aquamarine Pimpernel. As usual, Friday’s scorching intellect and lack of social skills play a big part in this tale filled with quirky characters and amazing twists. If you’re looking for a chapter book with a strong female heroine, lots of humour, problems to solve and a world kids will readily engage in, grab Friday Barnes: Big Trouble. I spoke of Magisterium: The Copper Gauntlet earlier this week. I think it will make a terrific book gift for kids who want something full of action, humour and intrigue. This is another intriguing novel for 10+. Here’s an excerpt from my review: "The tension is real and believable, the problems are tricky, and kids will be riveted by Moll’s adventures." Wordburger was written by David Astle and published by Allen and Unwin (2015). RRP:$Au 14.99. Word wizard David Astle has come up with a sneaky way to introduce children to the mechanics of cryptic crossword puzzles, by taking them through different kinds of wordplay - anagrams, pangrams, spoonerisms, tongue-twisters, homophones - before presenting them with crossword puzzles to solve using everything learnt so far. 'DA' puns and word plays abound, making this the word nerd's bible of wordy trickery and puzzling. Wordburger is a book aimed at young people who are interested in words - who love word play and diving down rabbit holes to discover fascinating facts about our language. It's one of those books you can dip into, but if kids work through it, they'll find they have acquired some very useful skills. In chapter 19, Astle reveals he's been leading up to an explanation of cryptic crossword clues. These sometimes fiendishly clever puzzles develop children's ability to think critically and problem solve. But the great thing about Wordburger, I believe, is that it shares the author's own love of word play and wry observations about the language changes in our society. If you know someone who adores cornering his parents to read aloud snippets of information, or someone who ROFLs with friends over the humour of double meanings, do check out Wordburger. If you’re looking for a different kind of bookish stocking stuffer, you can’t go past an e-book or an app, since neither occupy much space. Here’s an e-book, written by Julie Murphy, with cover art by Richard van Hoesel, and available at the Authors Unlimited website. That’s Wild! is a collection of short, fascinating articles on a range of subjects related to animals. Murphy knows how to talk to kids, and discusses topics that delve into the wild, wacky and truly wonderful. This book has something for everyone: from camouflage to communication, freaky behaviour to finding food, and seriously weird animal names to a wacky dating technique involving the colour blue. We’ve got wildlife, pets, farm animals and zoos covered. If your young zoologist prefers non-fiction, or if your kids struggle a little with longer denser text, this little e-book is available for $Au4.99 in ePub or .mobi formats. I told you about the book, Axel Scheffler’s Flip Flap Safari in my article, Top Book Gifts for Kids 2014. Here’s a new way for kids to play with words and images in the form of an iPad app from respected developer, Nosy Crow. What do you get when you cross a monkey with a porcupine? Why, a monkupine, of course! What about a leopard with a armadillo? Well, that would be a leopadillo, naturally! The third brilliant app in the hugely popular Flip Flap series, Axel Scheffler’s Flip Flap Jungle features eleven brand new animals and poems, from the UK’s best-selling illustrator. With 121 possible combinations, silly names and animal noises to make you giggle, this hilarious rhyming app is perfect for pre-schoolers. Swipe any part of the screen to create new animals and hear the poem read aloud, with original sound effects, jungle music, and text highlighting. If you’re buying a gift for youngsters who are not yet sure they love to read, and you want something inexpensive and educational but fun, take a look at Axel Scheffler’s Flip Flap Jungle app. The app is intuitive and works well, while the rhymes and art work will make kids giggle. Children won’t realise that hearing the words read aloud while they “read” along with the highlighted words is a great way to develop their reading skills. However, they WILL appreciate the game of creating mixed up animals, and I hope they’ll soon decide to create a flip flap book of their own! A newly created bumper collection of the very best strips from the golden age of Peanuts. Charles Schulz's Peanuts strips and characters are loved internationally, appealing to fans young and old since they first appeared in the 1950s. The Bumper Book of Peanuts takes fans back to the golden age of Peanuts, gathering the very best of the strip from the 60s, 70s and 80s. Packed with strips featuring Snoopy, Woodstock, Charlie Brown, Lucy, Linus and the rest of the beloved gang, this beautifully produced bumper collection is sure to delight Peanuts fans of all generations. Sometimes you need a special book for the coffee table, a book visitors can pick up and browse through and find something they remember. Maybe you want a book your youngster sees other family members reading and wants to read himself. Perhaps you remember and still love Peanuts and plan to buy this collection for yourself. Don’t hesitate! Folk around here have been reading the black and white strips aloud, claiming to have found the best bit and loudly persuading others to like their own favourite characters. Young visitors have had the chance to witness one way adults engage with books. I think The Bumper Book of Peanuts makes an excellent Christmas gift for your whole extended family! I was reminded all over again what a master Storyteller Rowling is. I was instantly in awe of Kay’s artistic skills, particularly the detailed images of places like Diagon Alley, the character traits he was able to portray in portraits, the fun of double page spreads like Newt Scamander’s Guide to Trolls. I think this beautifully illustrated novel deserves a place in every family’s home. It’s the sort of book youngsters with freshly washed hands can sit and page through with Grandma. It’s one anyone who knows the books or movies will be fascinated by. If you’re looking for a bookish heirloom, this may be it! The teeny tiniest of adorable farting ponies gives the biggest of laughs in this riotously inventive new title from Kate Beaton, the artist behind the bestselling Hark! A Vagrant. Our feisty heroine, Princess Pinecone, is understandably tired of receiving cosy sweaters each birthday. This year she wants a fast strong horse, one suitable for the mighty warrior she imagines herself to be. Alas, the birthday pony is small, round and seems to have only two accomplishments: eating and farting. Can the Great Battle be anything other than a failure for the Princess and her pony? You might also be interested in checking out my recent posts: Recommended Books for Older Readers November 2015, Reviews: Recent Children’s Picture Books about Animals, 2015 (3) and A Sleigh Load of Fun Christmas Ideas for Kids. Find lots of suggestions for gifts in last year’s Top Book Gifts for Kids 2014. And as always, find more Children's Book Reviews on The Book Chook by clicking Reviews in the right sidebar.